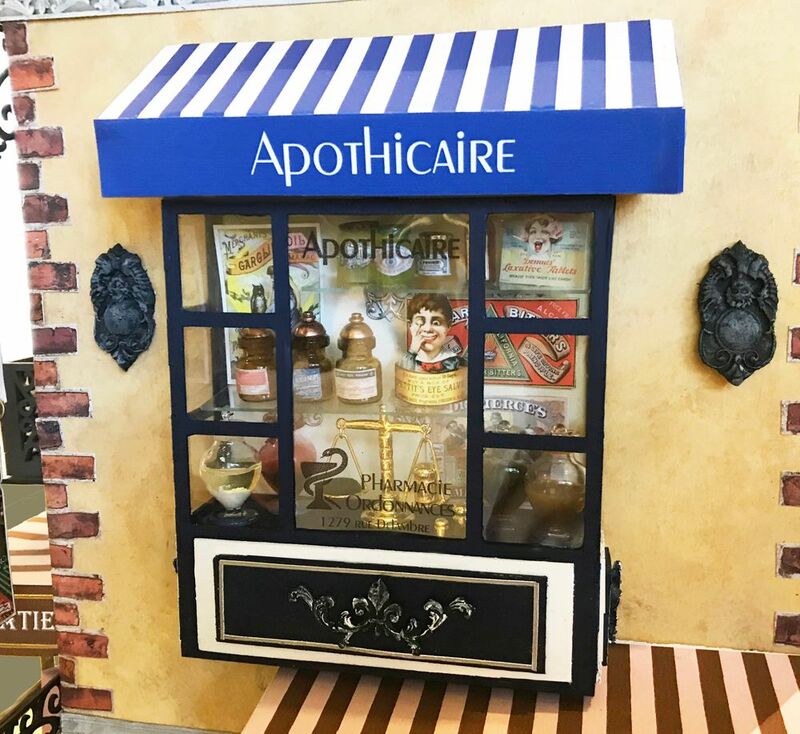 The final business in the Streets of Paris event is an apothecary. 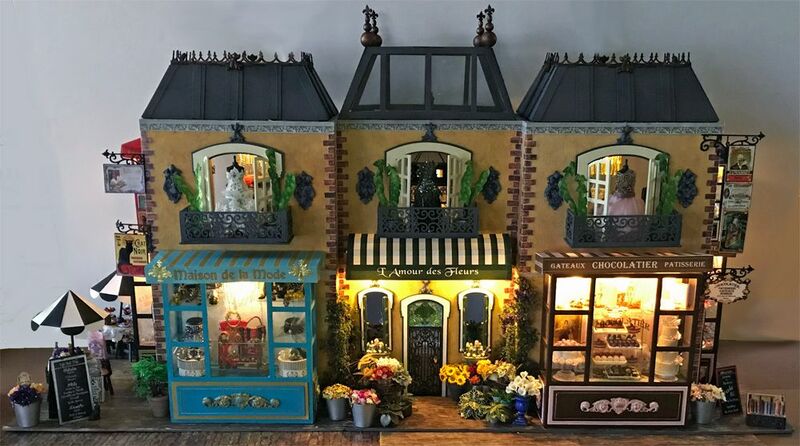 Just as with the Bookstore I’ve used a smaller bay window attached to the second floor on one of the sides to create a faux business. 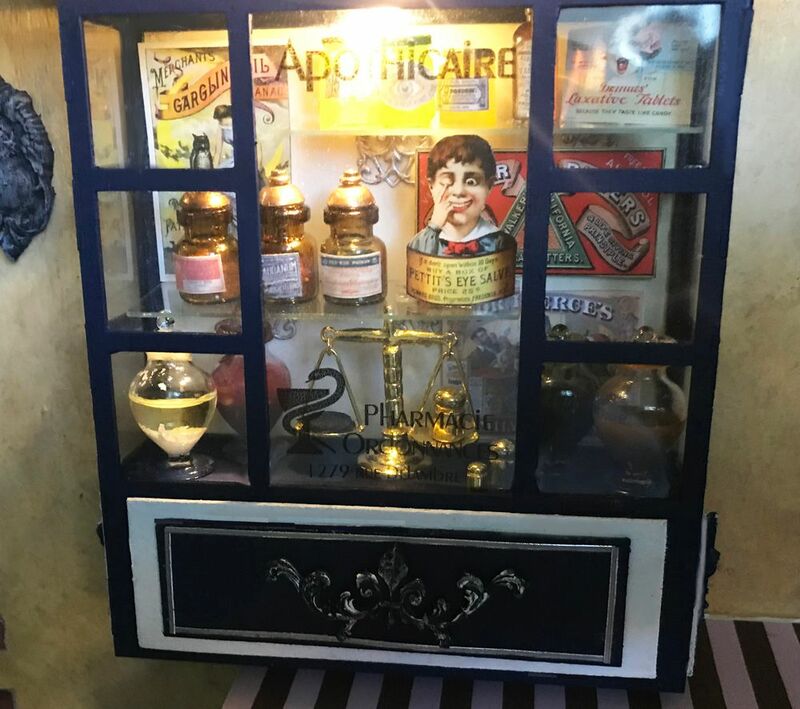 In the window are bottles, vintage drugstore ads and a mini scale with weights. 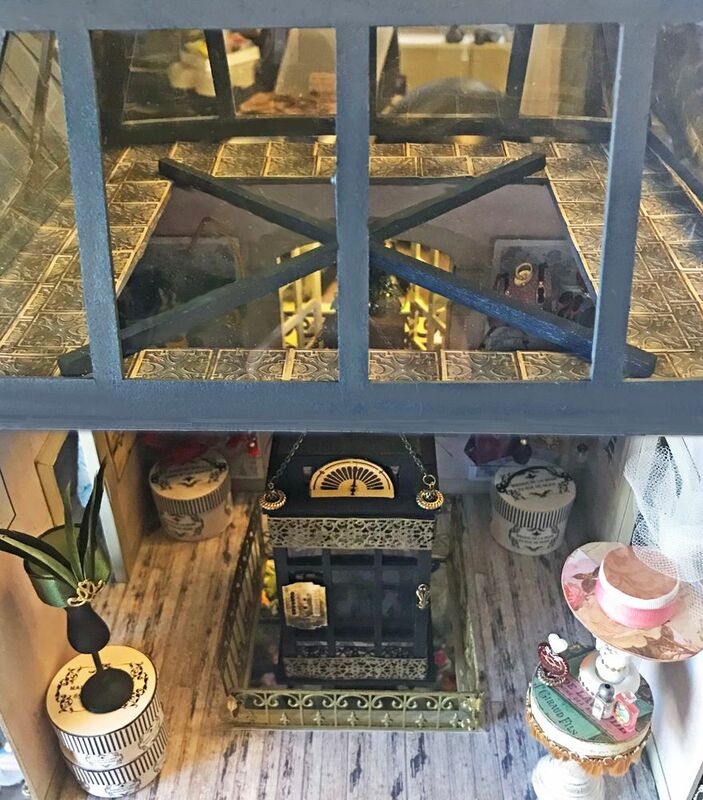 You’ll notice that the window has a pretty blue awning and the faux glass in the window has the business name and other details printed on it, you’ll find both of these free images further down in the post. 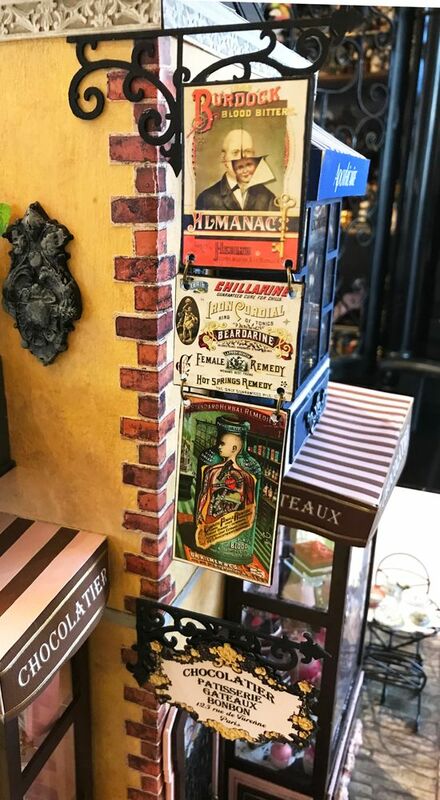 On the front of the building, I used die-cut scroll work to hang vintage drugstore adds that you’ll find in my new Vintage Drugstore Ads collage sheet or in the larger Vintage Drugstore Ads digital image set. Once again, for lighting, I’ve used a tea light that is hidden under the awing. 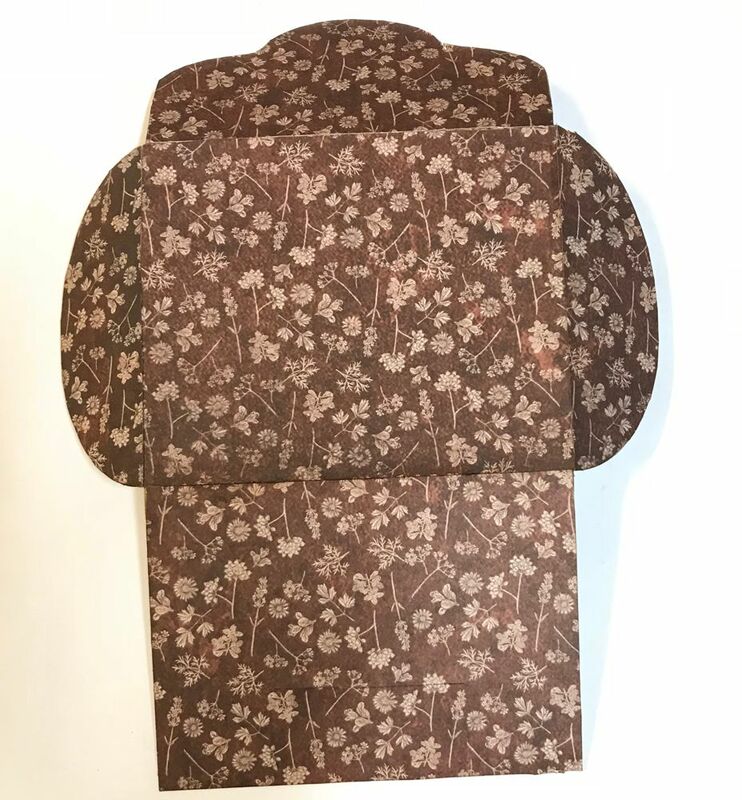 This sheet contains 19 images, some funny and some creepy. 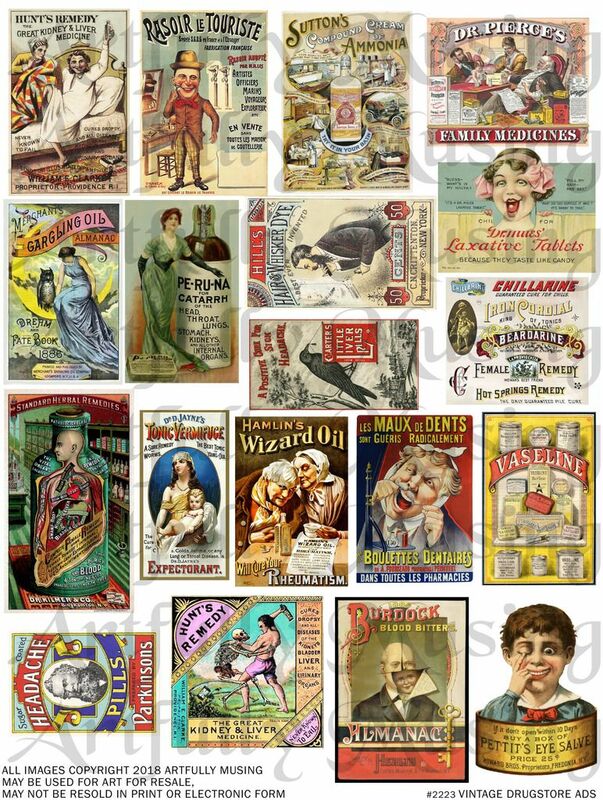 This image set contains 35 images including all of the mages found on the Vintage Drugstore Ads Collage Sheet. Some are funny and some creepy. 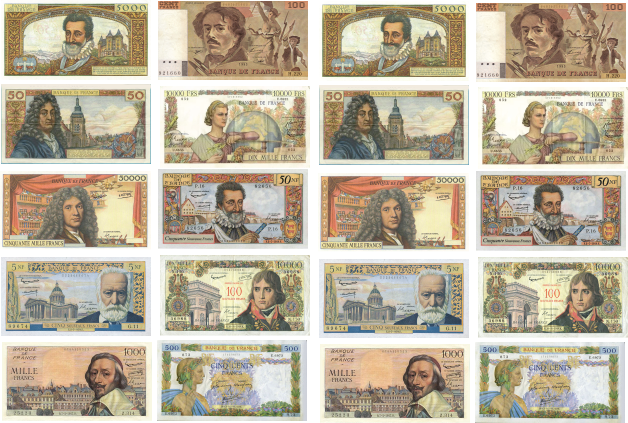 Feel free to download this collage sheet and use it in your projects. 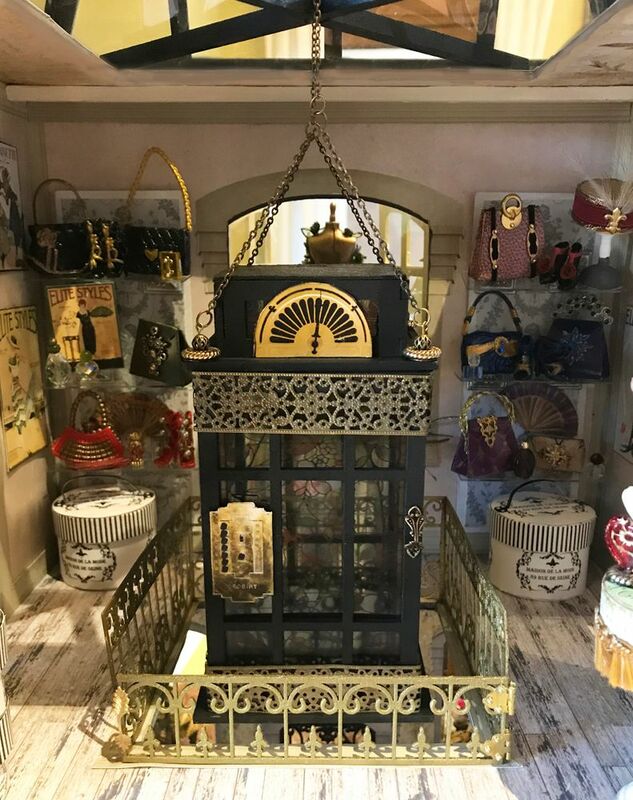 At long last, the Paris shops have installed an elevator in the center of the building. 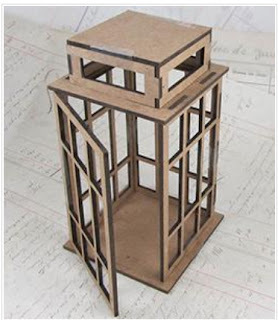 The secret to this elevator is an easy to assemble lantern kit which makes the construction a breeze. 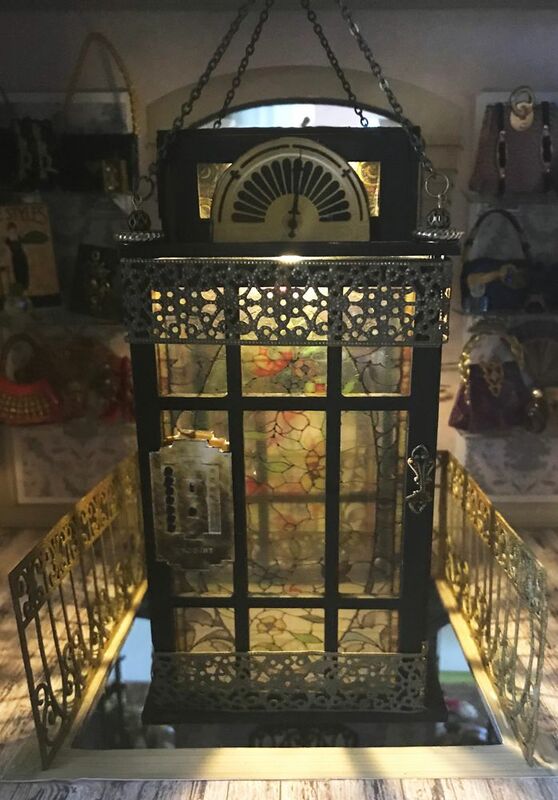 By adding vintage stained glass images (from my new digital image set, details below) printed on vellum to the inside, filigree and elevator images (free further down in the post) to the outside, you can create a lovely miniature elevator. On the inside of the lid is a tea light which gives the inside a soft glow. The elevator is suspended from the opening in the ceiling using a combination of basswood, chain and a pulley. In the video tutorial, I cover how to construct the elevator. Although this elevator is a non-working one, in the tutorial I cover how to make one that is working plus the option of using a staircase instead. 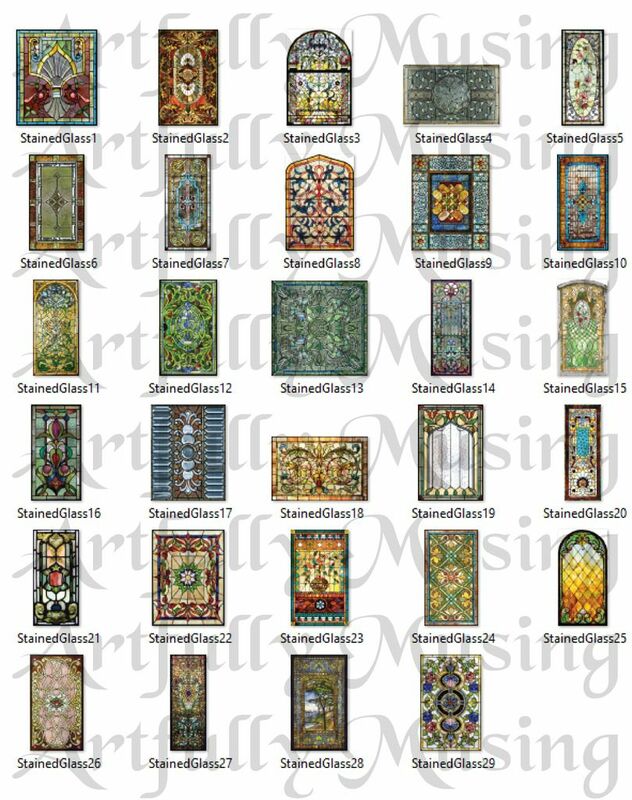 This image set contains 29 unique stained glass images. 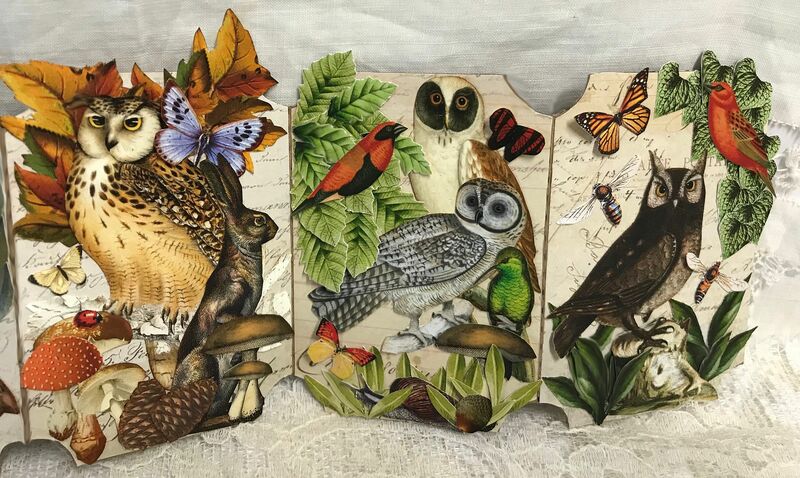 These images are great for collage projects or used as faux stained glass (printed on transparency film) in miniature projects. 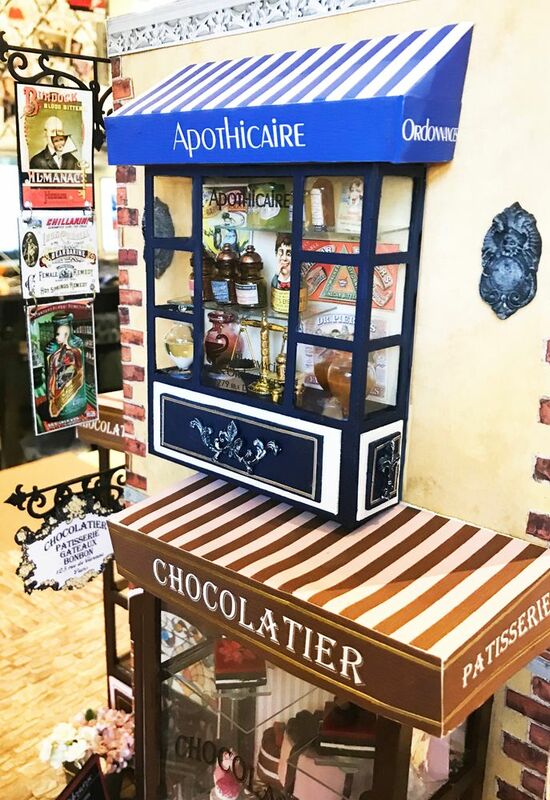 On the sidewalk outside of the shops, you’ll find a street artist painting scenes of Paris. 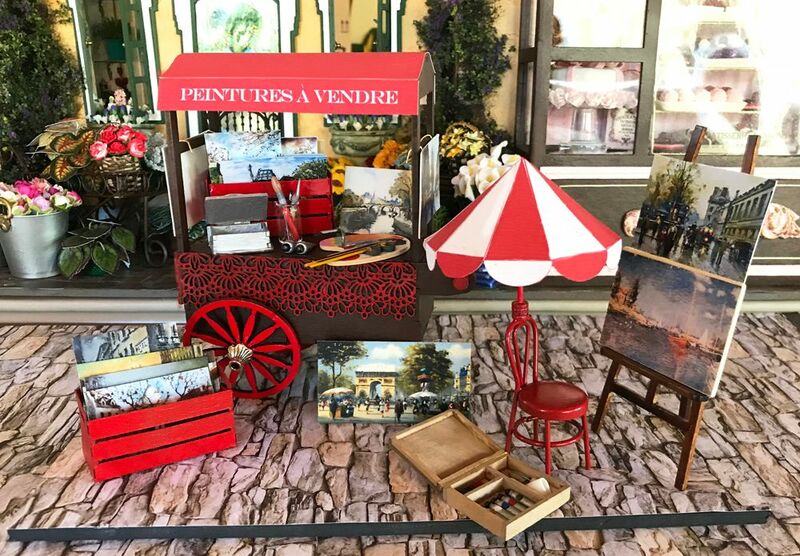 The red awning over the peddler’s cart says “Paintings for Sale”. Underneath is a crate full of paintings, a cashbox, and an artist palette. There are even more paintings hanging on the outside of the cart plus another crate of paintings sitting on the sidewalk. Next to the cart is a chair with an attached umbrella to keep away the sun while she paints. 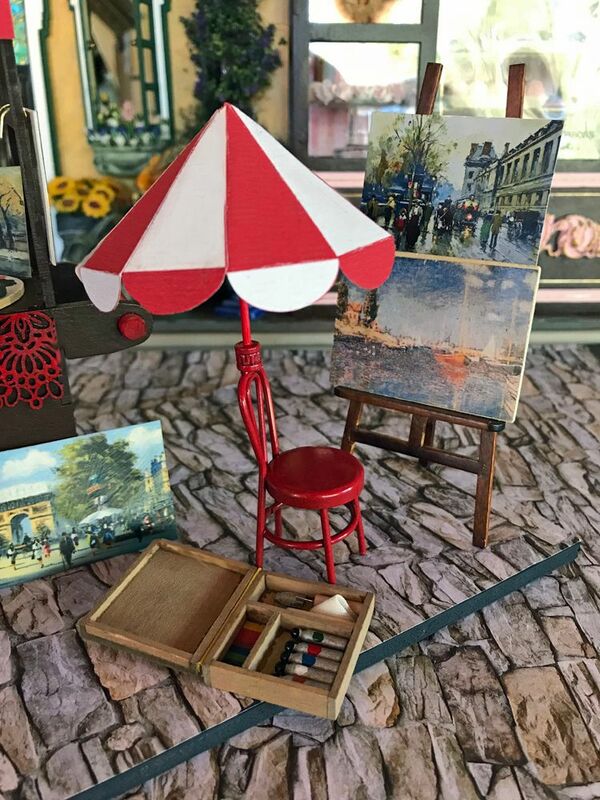 In addition, there is an easel with two finished paintings and a paint set. I’m guessing she is over at Cafe du Noir for lunch. 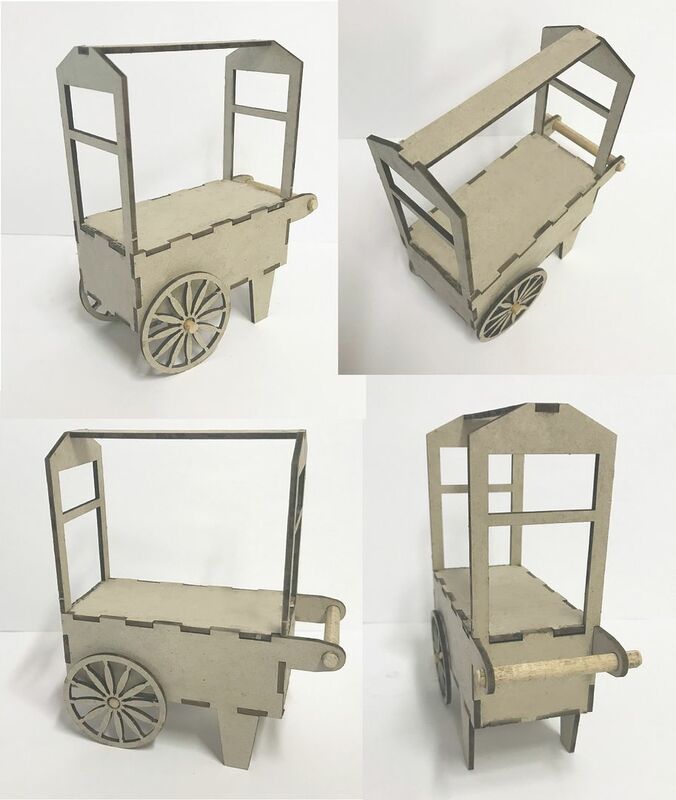 I thought adding a street vendor to the project would be cute and the inspiration for the theme of the vendor is the easy to assemble peddler’s cart pictured below. 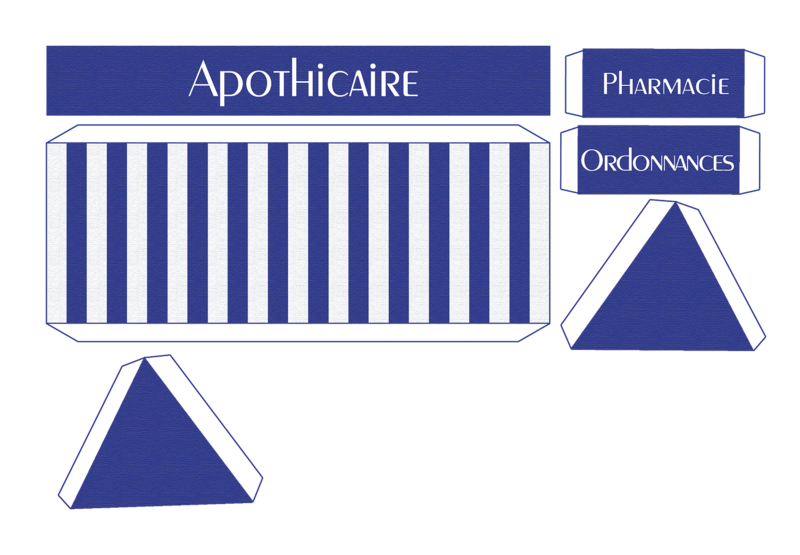 I can see this cart working for all kinds of themes and you’ll see me doing something different with it for Christmas. 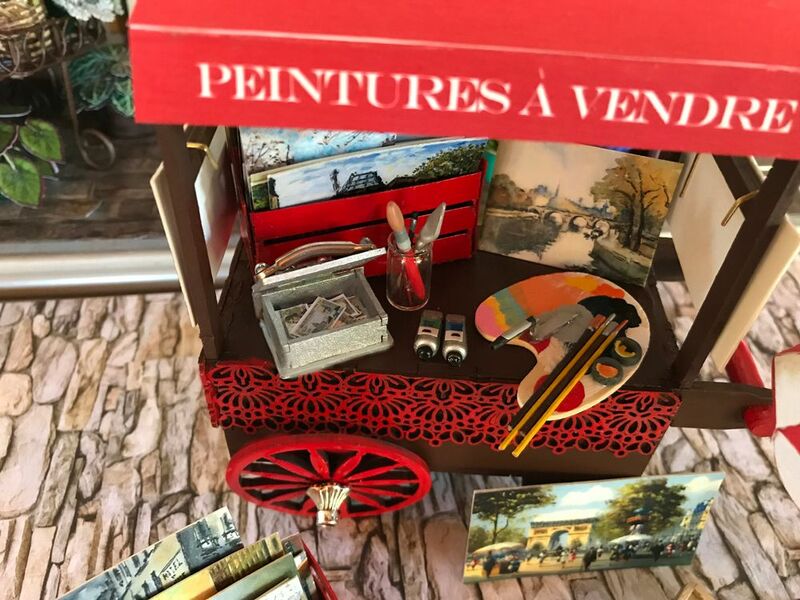 This was an easy and quick project to put together as I used multiple kits (peddler’s cart, crates & book box) and pre-made accessories (mini paint set in a box, artists pallet set, miniature easel with paintings and mini paint brushes). 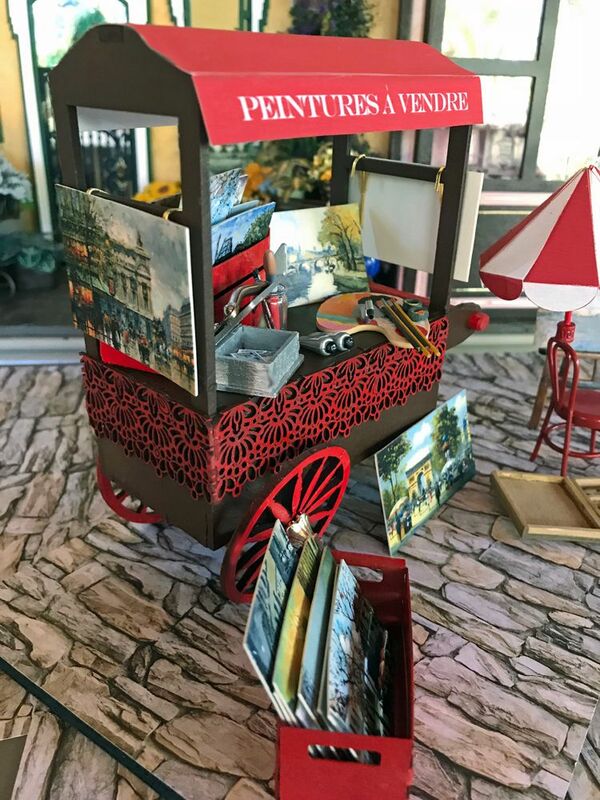 To go along with this project I’ve created a new collage sheet filled with mini Paris themed paintings. I also have some free images (awning, umbrella & mini money) for you that you will find further down in the post. 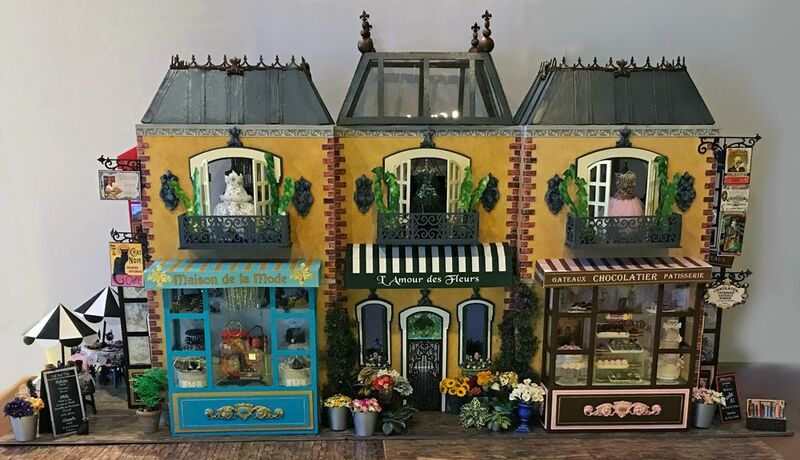 In the video tutorial below, I’ll walk you through how I assembled and decorated the kit items and how I put the scene together. 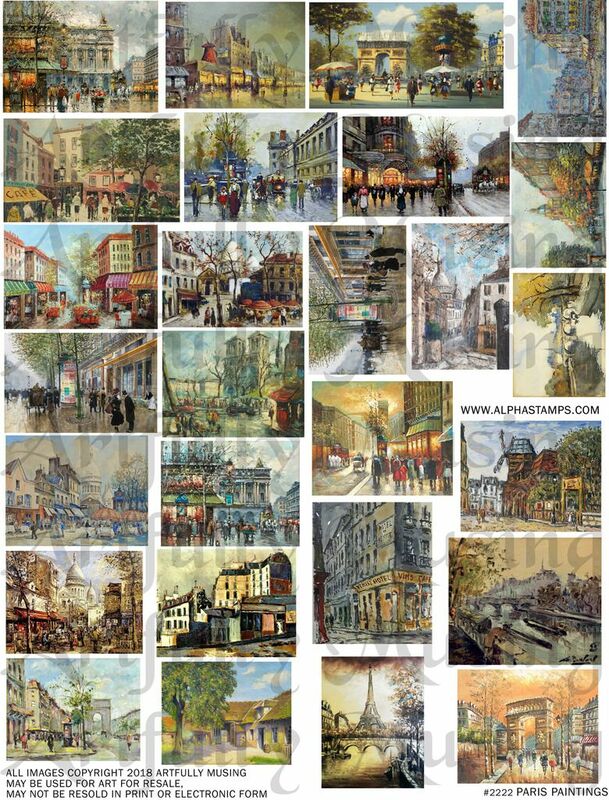 This sheet contains 27 miniature paintings of various scenes in Paris, France. 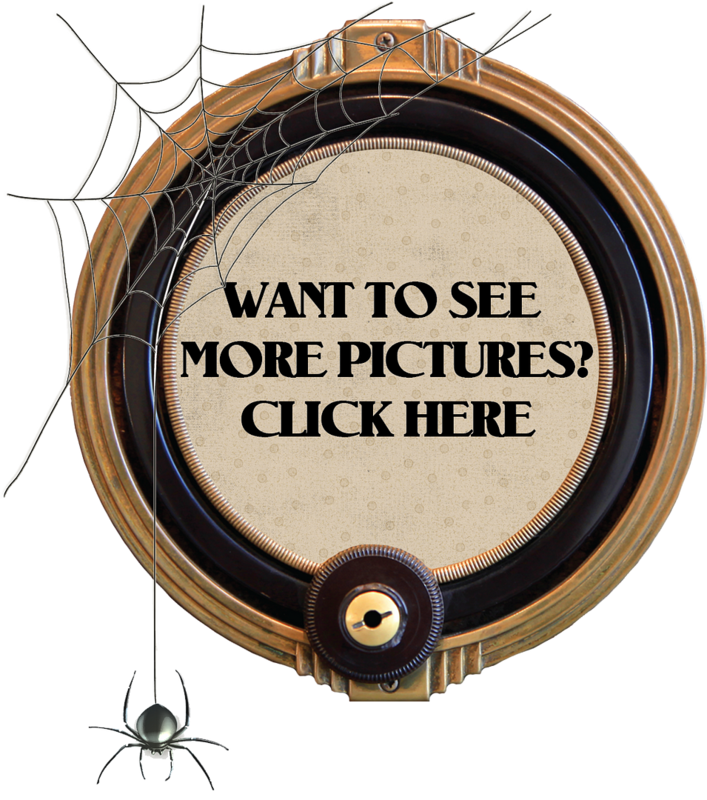 Feel free to download these images and use them in your project. 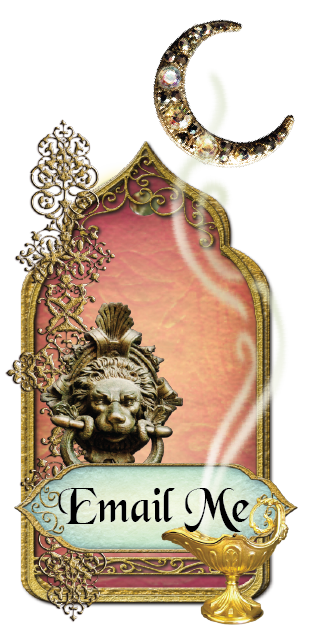 This project is inspired by the AlphaStamps August Anthology ATC Mailer kit. 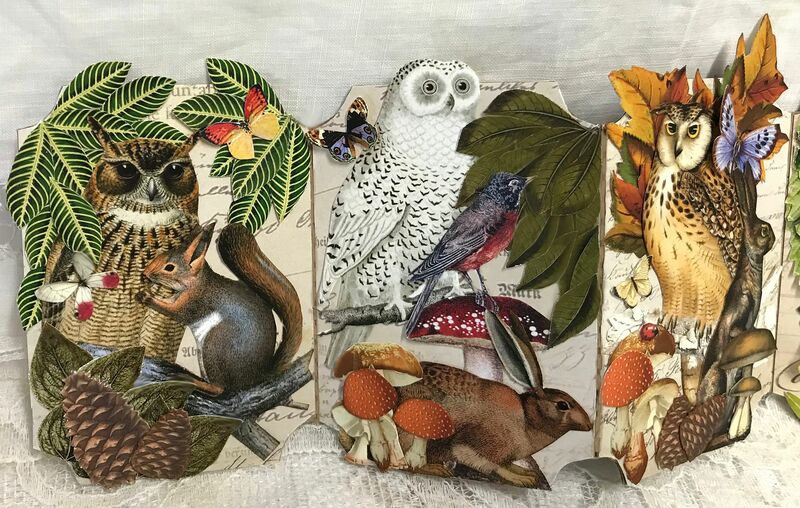 I decided to go with a nature theme and used a variety of collage sheet images to decorate both the mailer and inside ticket journal. I tied my journal together with a piece of lace. 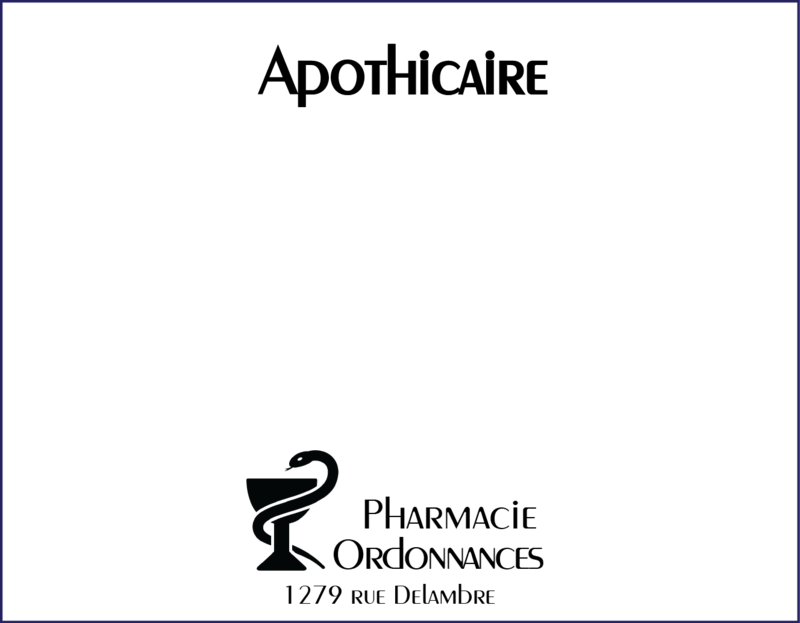 There are lots of ways you could use the mailer, for example, I think it would work great as an invitation. 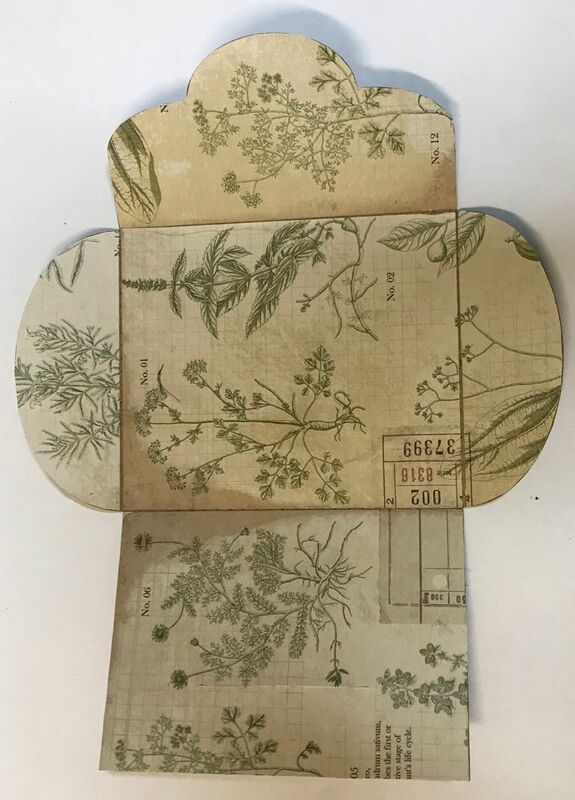 Inside the mailer are tabs where you can insert an ATC sized card. 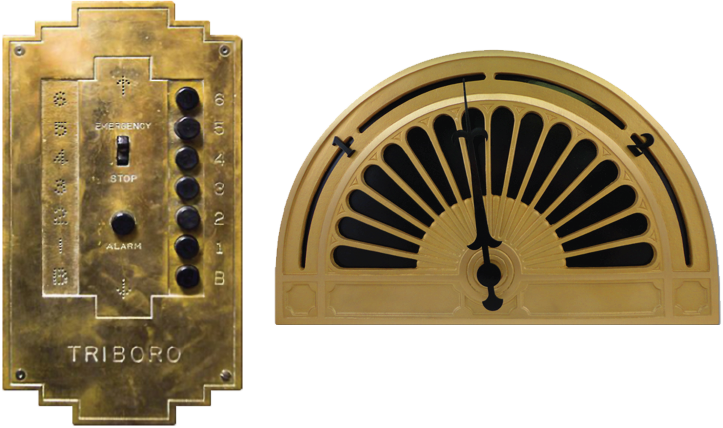 Below, I cover the details of how I assembled my project. 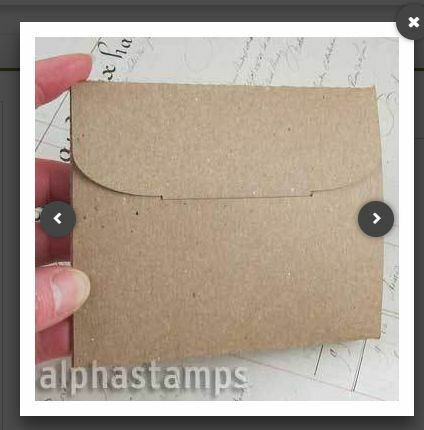 AlphaStamps is carrying all of the supplies I used which you will find in a supply list at the bottom of this post. I started by covering the outside and the inside of the mailer with decorative paper. I added an ATC sized card to the mailer tab. 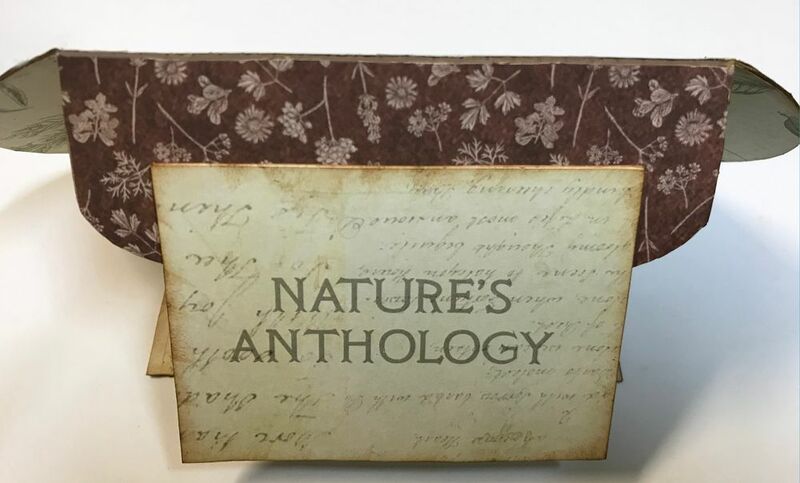 The card is covered with decorative paper on which I printed (by running the paper through my printer) “Nature’s Anthology”. 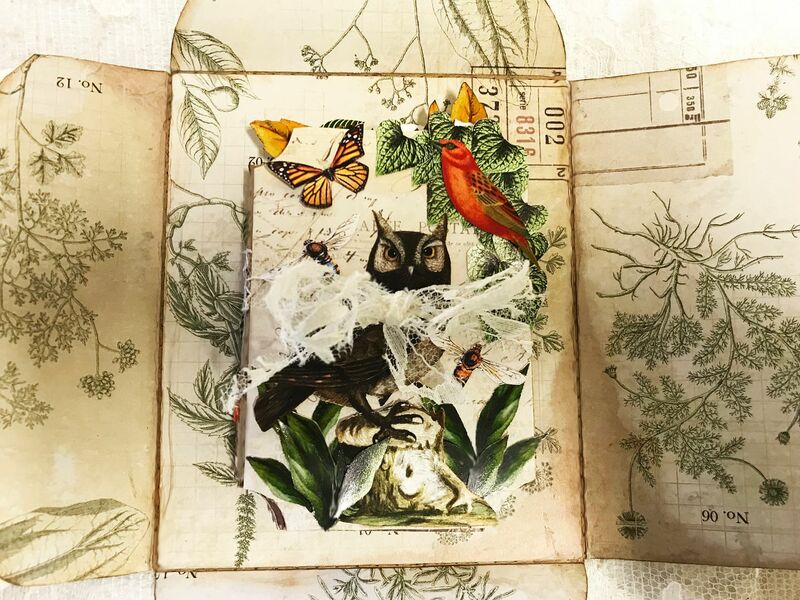 I covered the front and back of the ATC Ticket Journal with decorative paper. 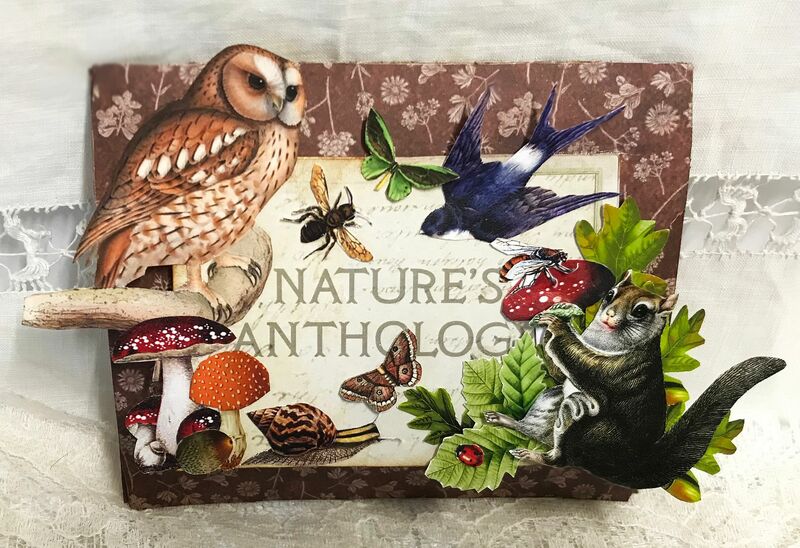 To decorate both the front of the ATC Envelope Folder and the ATC Ticket Journal I used 5 different collage sheets (see below in the supply list) that contained birds, squirrels, rabbits, bees, butterflies, snails, leaves, and toadstools. 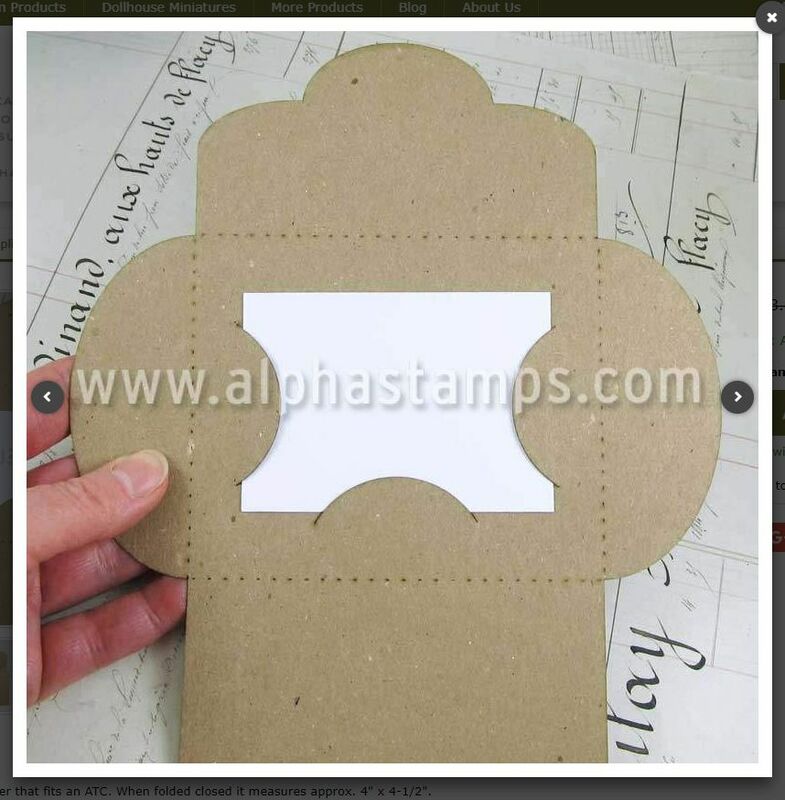 All of the embellishment is done with paper images which make it possible for the journal to fit inside the envelope.